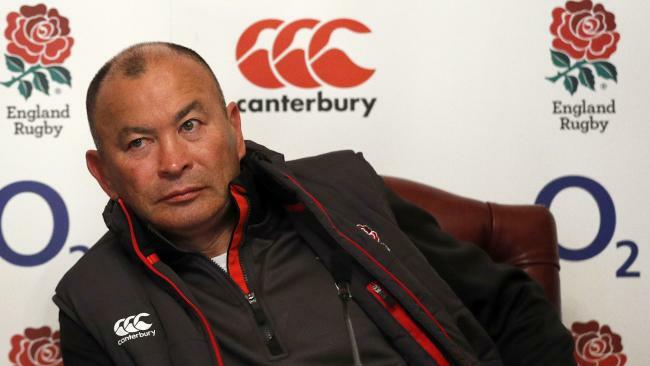 England coach Eddie Jones attends a press conference at Pennyhill Park. THREE men have been fined after hurling foul-mouthed abuse at England rugby coach Eddie Jones following Scotland's Calcutta Cup triumph. Footage released online showed the group approaching the 58-year-old Australian for a photograph as he left Manchester Oxford Road rail station on February 25 to catch a waiting car, before the atmosphere turned sour. One of the Scotland supporters shouted "What about last night, you baldy c---" and Jones was repeatedly called a "f------ baldy c---" as he was ushered into the car by his driver. Richie Cleeton, 22, Connor Inglis, 25, and Brett Grant, 23, all from Edinburgh, pleaded guilty to a public order offence of using threatening abusive words and behaviour, or disorderly behaviour, likely to cause harassment, alarm or distress. Sentencing the trio at Manchester Magistrates' Court, chair of the bench Joe Bangudu said: "This was a short-lived but disgraceful incident. "Your language, although described by your defence as industrial, we think was vile and therefore unacceptable directed to anybody. "The location where you chose to display your drunken behaviour was in a public vicinity, with not just Mr Jones in that proximity. "There could have been kids that could have been affected by your behaviour. "No one should ever have to put up with such language and behaviour. "We have not seen any sort of remorse by you. That is a concern." Cleeton was fined 120 pounds (A$216), Inglis 105 pounds ($A189) and Grant 140 pounds ($A252). All three were also ordered to pay court costs of 115 pounds ($A207) each. Bangudu said Grant had prolonged the behaviour and language by opening the car door once Jones was inside.